Colder weather means fish start to fight even harder as anglers are discovering. The fish are also going a bit deeper now and over the last week fishing has been good and there are plenty of bigger fish being caught as they stock up for the long winter. Pete Green had 23 fish, Paul Keir had 21, Gordon Grant 12, Slater Scott 12, Blair MacDonald 10. Black Fritz and White Fritz lures are doing well, as are Buzzers. Fishery season tickets are available from December 1. Current members have first chance to renew and if any are left after this they will be offered on a first come first served basis. Anglers with season tickets can benefit from fishing all year when the lochs are open and fish after 6pm, by arrangement, all on a catch and release basis. Water clarity remains excellent, with the water temperature sitting around 8oC to 9oC for most of the week but dropping to 7oC on Sunday after two cold nights. The fish were still taking in the top 2 feet until Friday with nymphs and lures being the most successful. At the end of the week they dropped to around 3 or 4 feet down, with the best results then being on intermediate lines. Fish are still turning on the surface, but going deeper with a slower retrieve was the preferred method. A few browns up to 5lb are still being caught and safely returned. 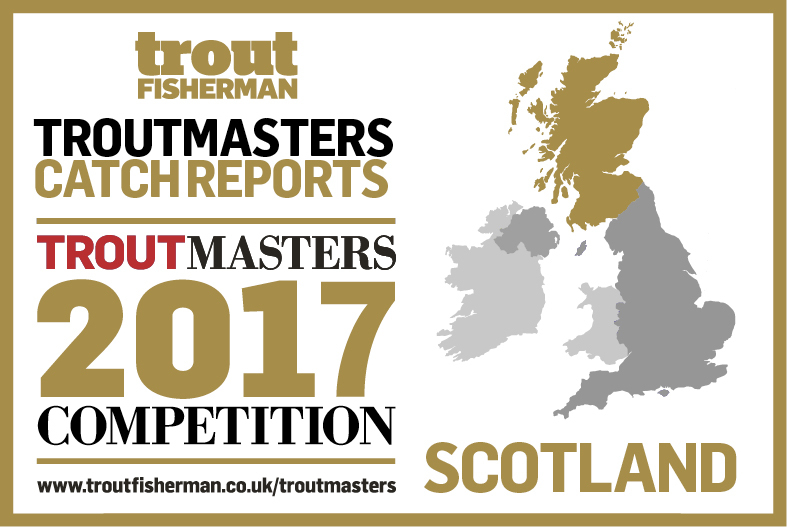 Golds and light blues, the biggest around 4lb 8oz, are figuring in the catch returns along with the usual top quality, hard-fighting rainbows. Favourite patterns included PTN, Daiwl Bach, Bloodworm, Hare’s Ear, Montana, Buzzer, Cormorant, Damsel, Cat’s Whisker and Dancer. Alan Laing, from Carluke, caught five fish for 14lb, plus 1 released; Willie Nyguist, Stirling, 4 for 12lb 4oz; Danny Doherty, Denny, 4 for 11lb 8oz, plus 8 released; George Dobbie, Glasgow, 4 for 11lb, plus 2 released; Frank Barr, Falkirk, 3 for 13lb, including a 5lb rainbow, plus 8 released; Marius Botezatu, Stirling, 3 for 10lb 4oz, plus 5 released; Billy Weir, Bannockburn, 3 golds for 10lb 4oz; Ian Whitfield, 3 for 10lb 2oz; Alan Prentice, Clackmannan, 3 for 10lb, plus 3 released; Robert Smith, Falkirk, 3 for 10lb, plus 3 released; Donald McMurchy, Fallin, 3 for 8lb 12oz, plus 3 released; Jim Spiers, Falkirk, 3 for 8lb 12oz, plus 3 released; Alan Weir, Stirling, 3 for 8lb 12oz, plus 2 released; Alec Knox, Glasgow, 3 for 8lb; Alan Whitton, Stirling, 2 blues for 7lb, plus a brown returned; John Sneddon, Falkirk, 2 golds for 6lb 8oz; Eric Mair, Alloa, 2 for 6lb; Kevin Gray caught and released 15; Brian Eadie caught and released 6.